Dr. Nereus Acosta (LP executive vice president), former Cong. Atty Eduardo Nachura and ANC Journalist Ricky Carandang pay attention to Ramon Casiple of IPER. 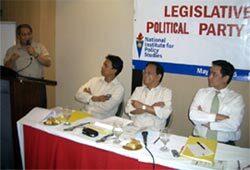 “Legislative Initiatives on Political Party System Reforms,” was the topic of a workshop organized by the National Institute for Policy Studies (NIPS) in cooperation with the Friedrich Naumann Foundation (FNF) in Pasig City on May 23, 2005. The objective of the half-day workshop was to update members of the liberal family about pending legislative initiatives in both Houses of Congress aimed at reforming the political party system. “If we survey the world, we will see that the more stable countries are those that have strong platform based political parties,” said Undersecretary of the Department of Education Atty. Jose Luis Martin “Chito” Gascon. The former executive director of NIPS has been at the forefront of the initiatives to strengthen the Philippine political party system for many years. At the workshop, the various bills related to political party reform were presented and discussed; such as those dealing with such vital issues as campaign financing, public funding of party organizations and the prohibition of political “turncoatism”. “The Senate and the House bills are practically the same,” said Roman Casiple, the Executive Director of the Institute for Political and Electoral Reforms, and he expressed optimism that they would soon be passed. Wrapping up the workshop, former Representative and NIPS Trustee Atty. Eduardo Nachura announced that he would present a position paper to the leadership of the Liberal Party supporting the legislative measures aimed at the reform of the Philippine political party system.